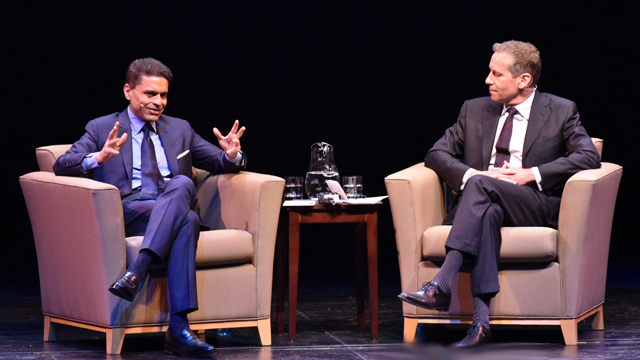 Zakaria — host of CNN’s "Fareed Zakaria GPS," contributing editor to The Atlantic and columnist for The Washington Post — visited UCLA to deliver the 2017–18 annual Daniel Pearl Memorial Lecture at the Burkle Center for International Relations. 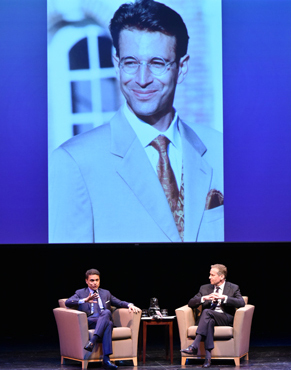 Daniel Pearl was an experienced and well-known journalist and the South Asia Bureau Chief of The Wall Street Journal at the time he was murdered by terrorists in Pakistan in 2002. Cosponsored by the Burkle Center, the Daniel Pearl Foundation and the Yitzhak Rabin Hillel Center for Jewish Life at UCLA, the event attracted a large audience in UCLA’s Schoenberg Hall. Zakaria’s speech was preceded by remarks by UCLA Professor Emeritus Judea Pearl, father of Daniel and president of the Daniel Pearl Foundation, and Rabbi Aaron Lerner, executive director of UCLA Hillel. 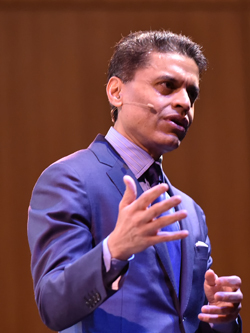 By the mid-1990s, said Zakaria, he realized that “there was a distinction one had to make between the ‘democracy’ part of a liberal democracy and the ‘liberal’ part of liberal democracy.” The foreign policy expert defined these two elements as the rule of the people (“democracy”) and the protection of liberty (“liberalism” in its classic definition, which seeks to restrain the power of government). with a photo of journalist Daniel Pearl in the background. (Photo: Todd Cheney/ UCLA, 2018). “[It’s] not so much how you get there — the means of selecting a government,” said Zakaria, “but what constraints and restraints [you] place on a government. How [you] limit the power of government so as to preserve and protect liberty.” Beginning with the Magna Carta in 1215 and proceeding through the checks and balances built into the U.S. constitution and other democratic constitutions worldwide, the speaker noted that liberal democracies have consistently sought to curtail the power of governments so as to protect individual rights and liberties. As the phenomenon of illiberal democracy has accelerated, he said, elected governments in countries around the world have weakened the democratic institutions that protect individual rights by attacking professional bureaucracies, the free press, the judiciary, academia and, in some cases, have taken control of the national economy. “[The] process of eliminating these kind of institutional checks on power is happening in [Russia], Poland and Hungary, just as surely as it is happening in Turkey,” said Zakaria. “And it’s even beginning to happen in more established democracies — certainly in democracies of longer tenure like India and Israel — where you are seeing attacks on the free press.” He pointed out that Turkey, a democracy, has now imprisoned more journalists than China. Assaults on these institutions have eroded the liberal element of liberal democracy, he insisted. “Why [this] is happening and what to do about it should be the central political question that we grapple with as citizens of the oldest constitutional republic in the world,” he concluded. Zakaria asserted that the administration of President Donald Trump was waging similar attacks on liberal democratic institutions. He noted the near-daily attacks on the free press, the search for legal means to prosecute journalists and media outlets, the undermining of the independence and professionalism of government bureaucracies such as the FBI and other intelligence agencies, a “ramped-up strategy to stack the courts with compliant judges” and attempts to reduce the power and influence of academic institutions. “For the last year and a half, you have seen the extraordinary reality that authoritarian rulers around the world — who have been jailing, punishing, abusing or in some ways facilitating the killing of journalists — have justified what they have said by quoting Donald Trump,” said the speaker. “I cannot think of a previous moment in history where authoritarian leaders around the world have quoted the president of the United States to support their authoritarian acts,” he remarked. Although Zakaria remained an optimist with regard to the strength and vitality of U.S. democracy, he was not complacent. Without a strong public counter-reaction that can check the abuse of power by government, he feared not a coup, but a trend of “defining deviancy down” (in the words of the late Senator Daniel Patrick Moynihan). “What I'm talking about is the systematic erosion of the norms which make up the institutions, which make up the system which we cherish as American democracy. That's what I worry about,” he said. It will be far easier for future presidents to refuse to publish their tax returns, he explained, or fire an FBI director whom they don’t like, or attack a media outlet because the previous officeholder did so. Answering a series of questions on international relations by Burkle Center Director Kal Raustiala, Zakaria claimed North Korea was rational in that it sought regime survival. “It strikes me that they are playing a very clever game. They are not going to give up their weapons. The [actor] who is being irrational in this circumstance is the American state,” he said, dismissing the idea that North Korea would agree to eliminating its nuclear arsenal. With respect to China and its growing power, Zakaria pointed out that it remained one of the most mercantilist countries in the world. “It's a one-party state,” he explained. “It has a very different conception of global order than the United States or the United Kingdom before it. So what we don't know is what that increased Chinese influence will translate into for the global order. “The Chinese really believe more than anything else in Chinese greatness,” continued the speaker. Whereas the United States has a universalist sense of identity and created a rules-based order that subordinated its own power and allowed other states to flourish, he claimed that China has an ethno-nationalist conception of its role in the world. What is clear, he said, is that China has chosen to pursue economic power over military power, limiting its military aspirations to impressive regional influence, a stance reflected in the composition of its navy and armed forces. “In that sense, they are playing the long game,” concluded Zakaria.